This track is awsome. In my opinion it challenges the Overland Telegraph Track but only one crossing. It is steep from both directions and the water is running fast and is deep. A challenge for any traveller. 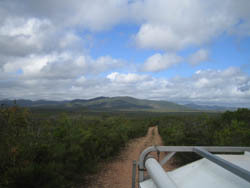 the scenery is second to none, It changes from saltbush flats to rainforest to mud flats. It is rough and slow going. Generally high clearance vehicles will have not too much trouble depending on the depth of the Pascoe River.